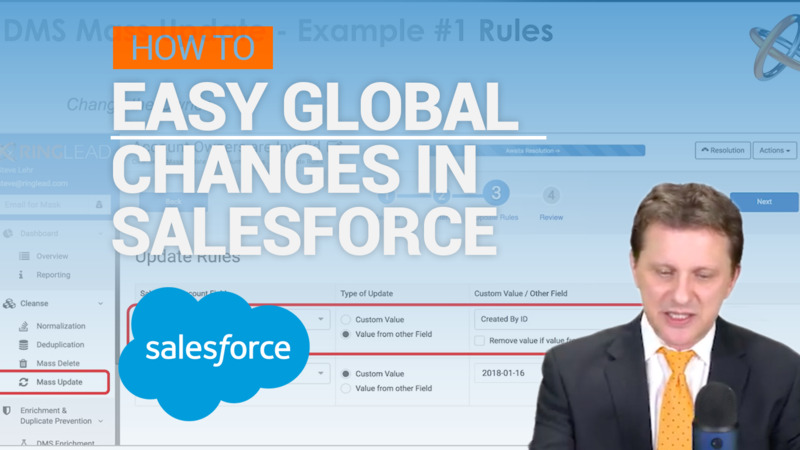 Make Easy Global Changes In Salesforce With Mass Update! In this video, Steve Lehr explains how users can use RingLead DMS Cleanse Mass Update feature to help you save thousands of dollars in Salesforce overage costs by easily updating hundreds of records at once with the click of a button. Mass update allows users to quickly find and merge custom objects, regardless of whether they’re related to standard objects or other custom objects. Mass Update is critical for any Salesforce Admin, because unlike Salesforces 250 record limit that you have to go through one by one, you can easily update hundreds of records with the click of a button using Mass Delete. RingLead DMS Cleanse is only one of five products in RingLead’s Data Management Solution lineup. RingLead DMS is the only cloud-based platform that can capture, clean, protect, enrich and normalize all of data in a user’s CRM in real time. RingLead DMS will change the way you manage your data and empower you to take control of your data quality once again. Schedule a demo today by clicking the box below!